Fiery, elegant, lyrical, impossibly virtuosic, yet crystal clear–such is Joaquín Pozo’s style. Known to many as “el pulpo” (octopus) because of his incredible facility with the congas, Pozo comes from a long line of Cuban artists, some of whom were very influential in the shaping of Afro-Latin jazz. He is an heir of the Rumba tradition, which he learned in the streets and clubs of Havana from a young age, and has become a revered figure in the world of latin music. He stands out both for the depth of his sound, which reverberates with traditional and modern echoes, but also for his unique vision of the tumbadoras as the melodic instrument in the band. Whether he is taking a monumental solo (such as the ten-minute tour de force “Momentos,” from his album Descarga Cubana), or driving the band with athletic vigor in both traditional numbers and creative originals, Pozo demonstrates his broad musical vision with what could be coldly described as impeccable rigor, were it not for the playfulness and sheer joy that radiate from his performance. 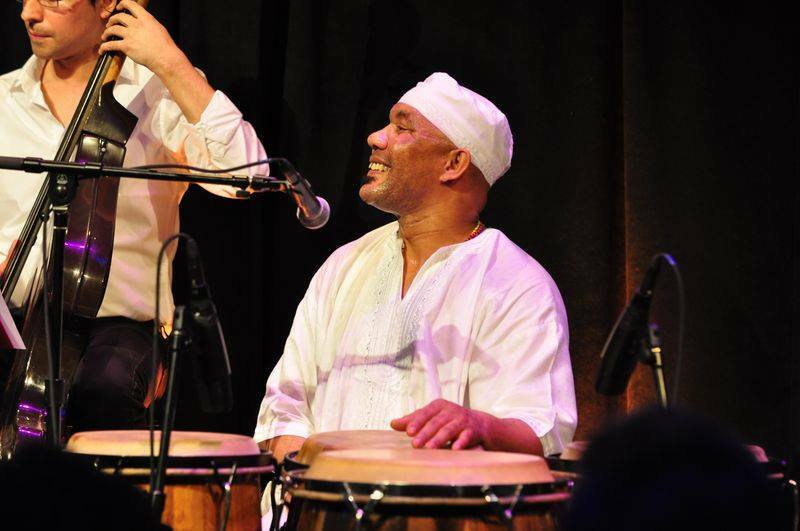 For his engagement at our stage Mr. Pozo will be joined by other renowned figures of the NYC Latin jazz scene: Arturo Stable on timbal, Marcelo Casagrandi on piano and Carlos Mena on bass. A unique chance to enjoy an intimate concert by one of Cuba’s living legends! Joaquin Pozo & Latin Millennium; Friday July 17th, 2015 at 10:00 pm. No Replies to "JOAQUIN POZO & LATIN MILLENNIUM"